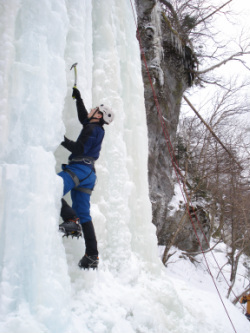 Have you ever thought of how cool it would be to climb a frozen waterfall? We can make it happen. Our skilled, enthusiastic instructors will teach you the techniques necessary to climb on low-angled beginner ice climbs. Vermont Adventure Tours supplies you with all the technical equipment and instruction to allow for an exciting, and rewarding day on the ice.